Stage 9 is one of Germany’s largest TV show studios. 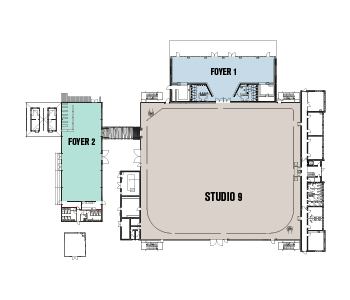 Stage 9 features a special VIP area including an exclusive driveway for red carpet events, a waiting area for the audience as well as an outbuilding with 34 ancillary rooms, 2 make-up rooms and 2 VIP lounges. The stage features 50 movable holding devices for lighting fixtures (white light) and air conditioning. Being used together with the immediately adjacent Stage 12 this Studio stage is particularly suitable for trade fairs and events, however, mainly for TV show productions with an audience of up to 1500 people. For this purpose, we are happy to offer to you our OB-Van. Film productions with larger space requirements are also among our regular customers.